From turkey, to stuffing, to delicious home-baked pies and more, Thanksgiving is a holiday meant for indulgence – but how much is too much? Take a walk – Get the family together for a walk before and after the meal. It will be an excellent time to bond and get outdoors while burning off those extra calories. 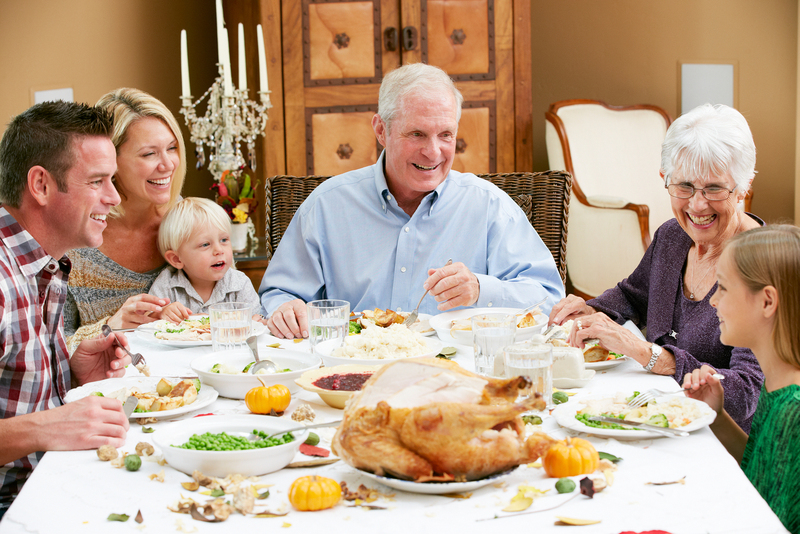 Before the big meal, encourage your family to increase their fitness routine, starting a week ahead of time. Eat breakfast – It’s tempting to skip breakfast, knowing you will eat a big meal later but eating a substantial meal in the morning will prevent you from overindulging later. Try this healthy version of french toast for a festive and filling holiday breakfast. Watch your portions – Before you dig in, survey the table and choose foods that you absolutely can’t live without. Don’t waste calories on foods that you can eat all year long. White turkey meat, plain vegetables, roasted sweet potatoes, mashed potatoes, defatted gravy, and pumpkin pie tend to be the best bets because they are lower in fat and calories. Resist the urge to go back for second helpings. Remember leftovers are better the next day! Try this healthy version of Cranberry Salad for a tasty and nutritious side dish. Eat slowly – Enjoy every bite and put your fork down between every bite. Chew every bite completely to be satisfied with one plate of food. Fruits and veggies, broth based soups and whole grains will satisfy you and add to the feeling of fullness. Experts suggest eating your meal midday and at dinnertime enjoy dessert a few hours after the meal. Be realistic – If you and your family are trying to lose weight right now, shift your mindset to weight maintenance instead of weight loss. You will already be ahead of the game if you aim to maintain your weight during the holiday season. Prime Rib – This choice of beef comes from the fattiest part of the cow with a whopping 37 grams of fat! Choose a leaner cut like sirloin to save calories. Baked Potato – A baked potato isn’t bad but it is the toppings that makes this dish one of the worst at the table. Just one tablespoon of butter can have 100 calories! If you must have this food, put salsa on top instead of butter and sour cream. Egg Nog – The main ingredients in this holiday drink are cream, eggs and sugar adding up to 180 calories and 9 grams of fat for an four ounce serving. Try hot chocolate instead, it contains only 80 calories and 3 grams of fat when mixed with water! Pecan Pie Ala Mode – This dangerous dessert has 870 calories and 65 grams of fat for just one serving. Instead try angel food cake with chocolate for dipping and cut out more than half of the calories! Check out Dr. K’s book for more healthy recipes using natural ingredients and practical advice for a healthy family.